Up to eight people can fit inside the 2017 Toyota Sequoia thanks to this SUV’s three rows of comfortable seating. Once inside, you’ll learn the Sequoia is extremely quiet due to the use of soundproofing materials in the vehicle’s design. Every 2017 Sequoia comes standard with three-zone climate control, a rearview camera, and a power-sliding moonroof. In addition, you’ll get the choice of either a second row bench seat or dual captain’s chairs. Motivating each and every 2017 Toyota Sequoia is a 5.7-liter V8 engine that pumps out 381 horsepower and 401 lb-ft of torque. That engine is paired with a six-speed automatic transmission that helps the Sequoia accelerate from 0 to 60 mph in less than seven seconds. This strong powertrain is also the reason why the Sequoia can tow up to 7,400 pounds, which is more than enough muscle to haul a fishing boat or camper. 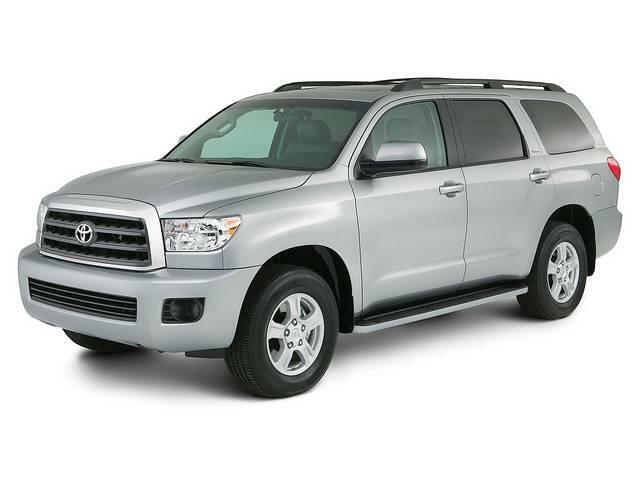 The new Toyota Sequoia gives you the choice of either a standard rear-wheel drive (RWD) or an available four-wheel driving system (4WD). The RWD version of the Sequoia provides the best fuel economy at 15 mpg combined, while the 4WD model provides increased traction and grip on challenging roadways that are covered in snow or ice. Upgrading to AWD adds approximately $3,000 to the overall cost of the Sequoia.